BOSTON — Mitch Marner scored twice, including one on a short-handed penalty shot, as the Toronto Maple Leafs downed the Boston Bruins 4-1 on Thursday to grab a 1-0 lead in their best-of-seven first-round playoff series. William Nylander and John Tavares, into and empty net, had the other goals for Toronto, which got 37 saves from Frederik Andersen. "We know we're a fast team in this locker room," Marner said. "When we play right, it's hard to stop us." Boston, which won three of the teams' four meetings in the regular season, beat Toronto in seven games at the same juncture of the last spring's playoffs — including a four-goal third period in the decider that turned a 4-3 deficit into a 7-4 win. "He's an elite player in the league at a young age," Bruins head coach Bruce Cassidy said. "He's always played well against us, always played hard against us." 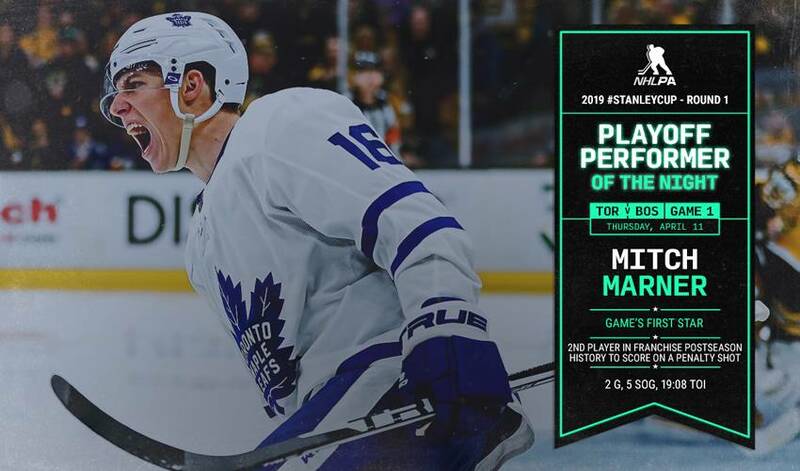 Marner, who scored the Leafs' first goal on a penalty shot in the playoffs since Mats Sundin in 1999, led Toronto with nine points in last year's series with the Bruins. Auston Matthews then found iron at the other end, but the visitors went up 3-1 with 1:35 left in the second when Nylander fired between Rask's pads on another break after taking a terrific stretch pass from Nazem Kadri. Joakim Nordstrom had a great chance for Boston seven minutes into the third, but the puck just trickled wide of Andersen's post. Boston continued to push, but Andersen and the Leafs held their nerve before Tavares iced it into an empty net for Toronto's first victory in a Game 1 in 5,846 days — when Marner was five years old. The Bruins, who also stormed back to down the Leafs in Game 7 in the first round in 2013, finished with 107 points in 2018-19 compared to the Leafs' 100 to grab second place in the Atlantic Division, thanks in large part to a 15-0-4 surge from Jan. 29 to March 9. Brad Marchand used a subtle delay in the offensive zone before sliding a pass through the seam to Bergeron, who had a wide-open net as the Leafs' penalty killers were caught puck-watching. Boston's top line of Marchand, Bergeron and David Pastrnak combined for 30 points in last spring's series, including 20 in the first two games. Jake Muzzin's initial point shot was tipped by Marner in the shot before bouncing to the Leafs' winger, who slapped a shot that just got over the line through a crowd in the Bruins' crease at 16:44. The Leafs rocketed out of the standings early this season, but were only 10-10-5 over their final regular-season 25 games and registered just four wins over the schedule's final month (4-7-3). Notes: Garret Sparks dressed as the Leafs' backup goalie with Michael Hutchinson away from the team following the birth of his first child. ... Toronto holds an 8-7 edge in all-time playoff series between the franchises, but Boston has won the last five. ... Leafs winger Patrick Marleau played in the 185th playoff game of his career. ... Game 5, if necessary, would be back in Boston on Monday.